With a weird working schedule and two kids I constantly get woken up in the middle of a dream. I have to quickly deal with a child or some such situation and my dream quickly fades into the background. This often leaves me with the vague sense that I forgot to finish something I was doing earlier or that there’s somewhere I was supposed to go. The caffeine kills all that. 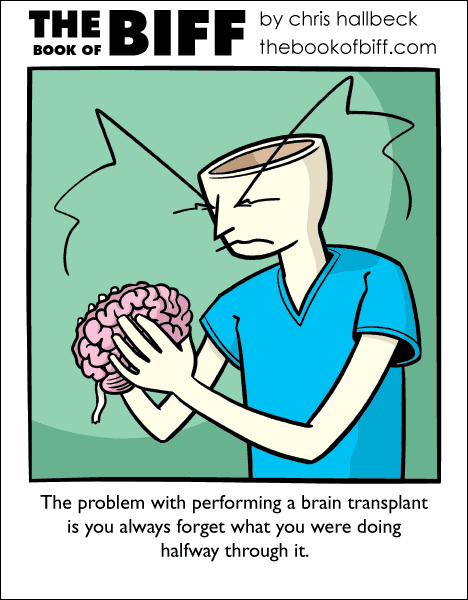 You ever hear of Karl Pilkington’s script idea for a brain transplant movie? It’s either the most genius, or utterly insane thing ever proposed, and I would watch it if someone was wild enough to commit it to film. what was I doing again? What’s this squishy gross thing? I’ve never needed to start a brain transplant to do that. And I didn’t need to be loaded to do that! Best worst Star Trek episode ever.